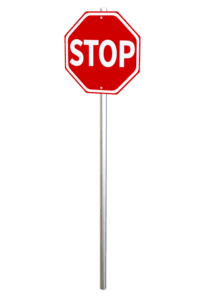 Drivers are required to come to a “full and complete stop” at stop signs. Where a driver is convicted of disobey stop sign, the ticket will go on the driving record for three years including any demerit points. Any moving violation on a driver’s abstract can affect your insurance rates. yield the right of way to traffic in the intersection or approaching the intersection on another highway so closely that to proceed would constitute an immediate hazard and, having so yielded the right of way, may proceed. The police and courts define a proper stop as “bringing the vehicle to a full and complete stop at or before the stop sign”. where the driver did not come to a “full and complete” stop at the stop sign. immediately before entering the intersection. Many times a “stop” can be something that happens momentarily or for just a second or so. The Highway Traffic Act does not specify how long the stop must be, only that it must be a full and complete stop. The perception of the officer may be different from the driver, or even the view point maybe obstructed. Where the driver attends court and provides evidence to the court that is just as credible as the officers, the Justice may dismiss the charge. During trial a proper cross-examination of the police officer must be made. This ensures that the officer actually did witness the driver fail to stop and that the police officer has covered all of the legal technicalities of a stop sign ticket.